The "watergate" scandal around the purchase of water from a politically-connected tax exile isn't atypical of Australian capitalism — it's the model for much of Australian business. Abbott is going full local candidate this time because he's facing a genuine challenger — and the early polling was terrible for him. Does Sri Lanka’s post-massacre social media ban make sense? This isn't the first time a government has put restrictions on social media. But the idea isn't without its faults. Australia now has its own "watergate" and there are calls for a royal commission. How did we get here? There are broader questions that don’t have clear answers, of course. But it's not so complex when you keep your eye on the ball. There’s no longer one election campaign. There’s hundreds, broken up by electorates, social media platform, gender, age, income and attitudes. The New York Times' recent investigation into the Murdoch family described James and Kathryn's more progressive leanings as one of the reasons for tension within the family. Grassroots campaign group GetUp has its sights on seven seats this election — and Peter Dutton’s marginal seat of Dickson is the priority target. What do the locals make of Abbott's competition? They quite like her. Or at least they want to like her. Divided votes and increased competition — David Leyonhjelm's recent failure may be a bellwether for things to come on May 18. The Coalition has to turn around the polls — and the the election is approaching even more rapidly than it might initially seem. The only economic issue in the coming election should be household income and how wages policy can lift it. Using a six-year-old statistic to plan for fertility rates could point to an attractive possibility for Morrison: baby bonus redux. By stunting the growth of the start up sector we're turning our backs on innovation and setting up the country for issues down the road. Is a great wave going to swamp Australia’s housing market? With a small but growing percentage of homeowners owing banks sums greater than the value of their homes, what are the looming risks to the economy? From climate change denialists to anti-vaxxers, Australia has its fair share of those who reject scientific consensus (and common wisdom). How a serious national newspaper wages editorial Holy Wars against its ideological, political and commercial enemies in the name of “news”. The former Agriculture Minister channels his inner Jan Brady (look it up!) in a truly hectic 30 minute interview. This week: looooooong-hand multiplication, the coming war with Iran, and Ellsberg and Chomsky on Assange. It's been a stupid election campaign so far and all signs point to it getting stupider. Labor targets Indigenous health priorities, but where’s the workforce? Labor has unveiled a boost to Indigenous health, recognising the need for Indigenous communities to be central to program development and implementation. But that requires a workforce. Australia views itself as Timor-Leste's liberator. But the reality is that Timor-Leste has suffered for decades because of Australia's pursuit of oil revenue above all else. What is the ABC for? Crikey tries to unravel and distill some of the crucial questions we think the ABC should be asking itself in this post-Guthrie/Milne era. Is it time to update the ABC Charter? We asked the experts. How much should the ABC be investing in Australian arts and culture? The NSW Liberals received donations from one of the beneficiaries of the controversial Murray-Darling Basin water contracts, and two Australians have been confirmed killed in the terror attacks in Sri Lanka. It's the news you need to know, with Chris Woods. Get ahead of the headlines with The Worm. Free to your inbox every weekday morning. Julian Assange did what any good journalist should do: minimise his source's chances of being found out. But that is now conspiracy to commit a crime in the eyes of the US government. News Corp CEO Robert Thomson attacked the New York Times and social media platforms in making the annual Keith Murdoch oration in Melbourne on Tuesday night. Traditionally the Easter holidays have been a non-ratings period — but with the rise of streaming television, commercial networks need to re-think their strategy. The debate over whether Julian Assange is a journalist or not serves no purpose other than to undercut future press freedom. 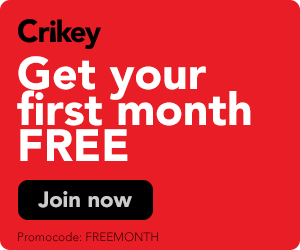 Give the gift of Crikey. Crikey is adding around a dozen journalists to dig, probe and deconstruct the big stories. Join now and don’t miss a minute.